My attention to detail, timeliness and work ethic help me exceed the expectations of our clients, something I strive for each and every day. Catherine Chlebowski’s practice focuses on general corporate and transactional matters. She has experience in corporate mergers and acquisitions, and commercial contracts for companies engaged in a wide array of industries. While earning her undergraduate degree from The University of Texas at Austin, Catherine was elected to the prestigious honor society of Phi Beta Kappa in 2014 and as a member of the Liberal Arts Honor College, wrote an honors thesis about the impact of social media on young voters. During law school, Catherine represented abused and neglected children in Dallas County through the W.W. Caruth, Jr. Child Advocacy Clinic, where she gained invaluable experience in advocacy. 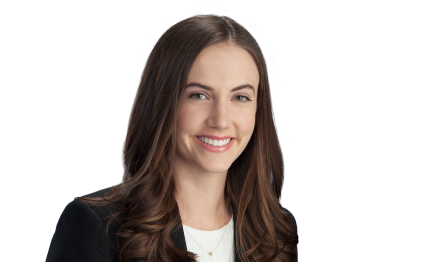 She also served as representative of her class in the Student Bar Association, served as editor for the SMU International Law Review Association, and completed more than 300 hours of pro bono law work through the State Bar of Texas Pro Bono College. Catherine's commitment to pro bono law work continues at Gray Reed as she co-chairs the firm's Pro Bono Committee.